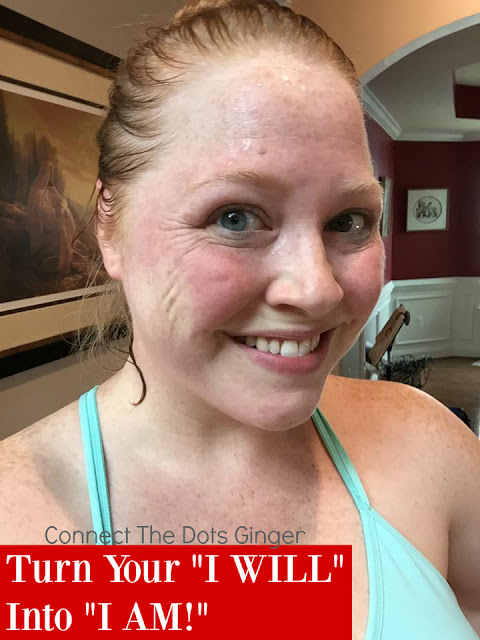 Connect the Dots Ginger | Becky Allen: Overcoming Challenges To Turn "I Will" Into "I AM!" Overcoming Challenges To Turn "I Will" Into "I AM!" I have never done a program like this before. I am pushing myself to trying new, hard and awkward things that a year ago I would have said was too hard, or way above my level and just half assed or not even attempted in the first place. Honestly there has only been one other time that I was able to push past those mental blocks of "you can't do this". When I was training for my half marathon while pregnant. I had made a goal with myself before I got pregnant that I was going to run that race no matter what, pregnant or not. And I did! And I will never ever forget the feeling of crossing that finish line with my best friend hand in hand. This past summer, I promised myself that I was going to go all in with this program when it came out. And I am. I have been doing the toughest workouts I have ever done, pushed past the mental barrier of "I CAN'T DO IT" and being able to say, YES, I AM ALREADY DOING IT! It is so empowering overcoming challenges. But it doesn't happen unless you try. Don't be afraid of trying new, hard things. You can adapt. You are so much stronger than you think you are. The thing that often times holds us back the most, is our own mind. But once you push past that, you can do anything! Here's to another day of loving myself, and not only surviving another workout, but finishing stronger in the end both mentally and physically! I AM DOING THIS! Nothing is standing in my way. You can do this too! Are you ready to start your 80 day completely life changing journey??? MESSAGE ME NOW! Let's get you started!